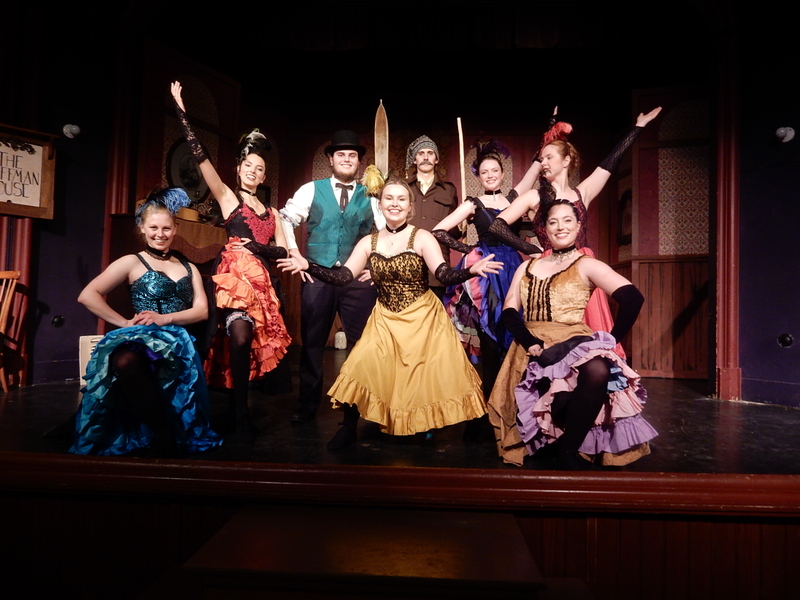 Rossland’s Gold Fever Follies is a community summertime tradition, enjoyed by residents and visitors alike. This year’s version does not disappoint. Romance, song and dance – the can-can – skiing and hockey; who could ask for more? On the well-attended opening night, the cast was short-handed by one actor – Molly Jamin -- who is recovering from an injury; but others filled in more than capably and showcased a rollicking tale of competition in love, skiing and women’s hockey. The story, like all Follies plots, is based on true events from Rossland’s history – the Rossland Women’s Hockey Team, Olaus Jeldness’s historic “tea party” celebration atop Red Mountain, and some of the mining deals during Rossland’s swashbuckling, gold-mining heyday. For the hockey thread in this plot, Sara Mayfield plays the stubborn and skillful “Cap” with a voice that needs no amplification. And tiny Regina Rios with her dazzling smile plays “Sprout” – a character with a decisive role. Long, tall Marco Santano plays Olaus Jeldness, and by the end of the play everyone should know how that name is pronounced – “Yeld-ness!” Santano has a lovely voice which would benefit from a bit more projection than I heard on opening night, because we’d all like to hear that voice at greater volume. I am in awe of the work and skill of Shirley McLim, who made all the costumes. And the statement on the program – that the play was “written by Lisa Henderson and Marnie Jacobsen, based on an original and much more historically accurate story by Brian Turner” – still makes me smile. Is it required that all actors be unusually good-looking? All of them in this production seem to be, as readers can see from the picture. I’ll be in the audience again this summer, to enjoy this year’s Follies all over again.